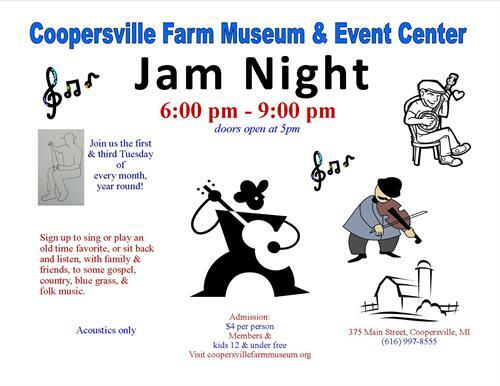 at Coopersville Farm Museum and Event Center, 375 Main Street, Coopersville, MI. Doors open at 5pm. Acoustics only, please. Sign up to play an old time folk song, a little blue grass, or even gospel…tell us what key it’s in so the other musicians can play along with you. Come just for the gathering of friends around the punch bowl or sit and listen all evening. $4 admission. Kids 12 and under free.